About a week ago, I picked up a 2013 Kawasaki Versys. 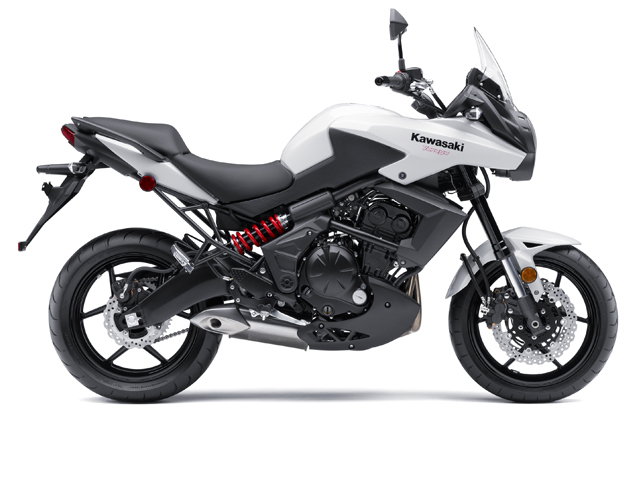 I wanted a bike that is primarily a street bike but could also be taken off-road on some well groomed trails and forest roads. I’ll be riding this out to California this year and look forward to exploring some new places that I was unable to visit in previous trips. It’s relatively lightweight bike weighing in at around 450 lbs with a 650cc parallel twin and a reasonable amount of suspension travel. I won’t bore you with all the details because it’s easy enough to find info on the web. On the street, it has good power and handles well. It’s a great bike for commuting. While is not exactly a dual-purpose bike, it seems to be fine on easy dirt/gravel roads. It’s well balanced and easy to maneuver at slow speeds so when I took it to a local state park and rode it on some easy trails I was pleasantly surprised at how well it did. I consider it a successful test of its off-road abilities since I didn’t get stuck or drop the bike. I’ve begun preparing the Versys for my trip to CA in a couple of weeks. So far I’ve added SW-Motech crash bars, a pair of highway pegs, a taller windscreen, some soft luggage, a 12v power socket, and a couple of RAM mounts on the handlebars. I’ll need to focus on the mediocre seat now. Overall, the Versys seems to be a good all-around bike that would be a great first bike for someone to get started on. It’s easy to ride with decent low-end power that builds nicely as you get the revs up. You’ll hear plenty more about this bike in a couple of weeks as I start my cross-country ride.